Moss growth on your roof can be detrimental to its lifespan by lifting shingles, which breaks the seal and allows water to get underneath the shingles themselves. 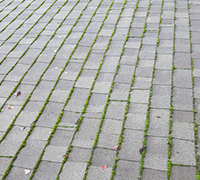 Moss, algae, lichens and mildew break down the bond on the asphalt shingles and granules. Moss can also degrade and break down your shingles removing valuable years off the life of your roof. We have created the safest, least abrasive technique to remove your moss by hand scrubbing the parts of the shingles that have growth. We remove at least 70%, usually more, of the moss on your roof during our cleaning process. 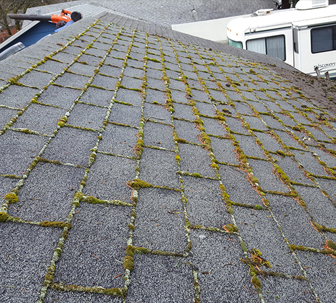 We also provide a granular form of moss treatment after the removal that will not only kill any remaining moss on your roof but also prevent new growth from happening. We recommend treating your roof at least once a year in the Pacific Northwest for an ongoing prevention method. We begin by using low-pressure compressed air to remove the heavy concentrations of moss and continue with hand scraping where necessary to remove any remaining moss clumps. After clearing away any moss debris from your gutters and downspouts, our technicians will apply a treatment to kill any remaining moss and prevent future moss growth on your roof. Our treatments are designed to be safe for use around children and pets and will not corrode your roof. Why Choose Us for Your Moss Removal? As a licensed, bonded and insured roofing company, one of the major benefits of having us clean your roof is we will also provide a roofing survey to see if there are any issues on your roofing system that need attention. For example: missing or torn shingles, cracked or broken roofing vents, failing pipe boots/jacks, failing flashing, missing sealant, etc. We will take pictures of any issues and provide a quote for repair and maintenance at the end of our cleaning process. We also recommend removing overhanging branches to provide proper air circulation and sunlight, as well as prevent damage from fallen branches that may be too close to the roof. Properly maintaining your roof can extend the life of your roof, and in some circumstances, exceed the normal life expectancy of your roof. By properly maintaining your roof you can save yourself thousands of dollars and avoid having to replace your roof prematurely. We provide this service for several real estate agents in the area, as they know the inspector for the buyer’s agent will recommend this be done before they purchase a home. Why is Roof Cleaning and Moss Removal So Important? Besides making your roof look fresh and new, regular roof cleaning can help preserve and protect the condition of your roof. Removing mold, algae and other contaminants aid in preventing decay that can eat away at your roof over time. Because cleaning can increase the lifespan of your roof, this simple maintenance technique can save you thousands on a replacement roof. At Grant Roofing & Pressure Washing, our team has a long track-record of cleaning roofs of all types for residential and commercial building owners, from the traditional shingled roof of single family homes to metal and concrete roofs. We understand the appropriate techniques to use in all cases to ensure a thorough cleaning without risking any damage to your property. Don’t Ignore Your Moss Problem! 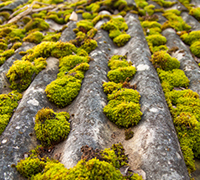 Moss growing on your roof may seem like little more than a nuisance, but nothing has the potential to degrade and corrode your roof more quickly than moss and lichen that are allowed to flourish unchecked. As many homeowners and commercial property owners in the Pacific Northwest are aware, the cool and damp weather conditions in the area provide the perfect environment for moss to thrive and proliferate. Moss is resilient and will not go away without treatment, causing increasing damage to your roof. Moreover, many insurance companies will decline to renew your residential or commercial insurance policy if you face a large moss infestation, leaving you to foot the bill for costly roof repairs or replacement. Checking for moss growth and removing any moss that is found should be part of your regular roof maintenance routine. Repairing your roof can be expensive, and the cost will only multiply if your roof is allowed to deteriorate to the point that it needs to be replaced. At Grant Roofing & Pressure Washing, our roofing technicians can carry out a complete program of regular roof maintenance for your home or commercial property. We will also do a thorough inspection of your roof while completing any routine maintenance such as moss removal in order to ensure that no minor roof conditions are given room to develop into major issues. Don’t wait until it’s too late to clean and maintain your roof. Poorly maintained roofing systems lead to leaks and serious property damage! Contact us today for a roof cleaning and we’ll provide a free roofing assessment to locate any potential issues.